The Pantry Challenge is done! This month we focused on what we have, to use it up and save money. Wow. Here we are at the end of the Pantry Challenge. The month went by fast, didn’t it? Seems like it was just Christmas. I’m thankful that the sun is shining today. In fact, we’ve had gorgeous weather all week. I don’t feel worse from my cold, either. Just a low-grade blah feeling. Which is better than death-warmed-over, don’t ya think? 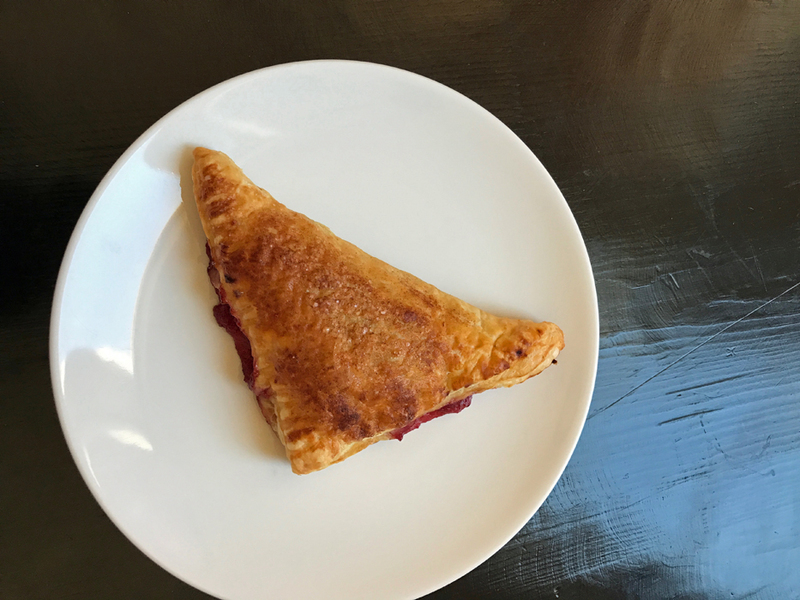 This morning I stirred a little of the Blood Orange Cherry preserves into applesauce and made Cherry-Apple Turnovers. Super easy and so very good. One of these days I need to make puff pastry myself. In the meantime, I was super thankful for a super coupon at the holidays that made our turnovers cost about 30 cents/piece. Then I spent the remainder of the morning cleaning out the pantry, fridge, and freezer. I mean, really cleaning. The big freezer is empty and wiped out, ready to be reloaded with the grains and flours sitting in my foyer. I removed every single item and every single drawer from my fridge and small freezer, wiped everything down, and reorganized. I rearranged and swept out the pantry. While we’re not at bare, bare bones, we’re close. As I mentioned last night, there are some random things that I don’t want to lose sight of, including but not limited to: buckwheat flour, garbanzo bean flour, rye flour, Israeli couscous, wild rice, barley, and a variety of oatmeals and hot cereals. Can you tell I went on a whole grain kick sometime over the last year? I’m not quite ready to buy all the things when I got to Costco and ALDI in the next few days, but I do have a list of things that would be really helpful to have on hand. I rely on pasta and tomato products a lot it would seem. I’ll be back tomorrow with the Grocery Geek Report for January. Spoiler alert: we met our goal for the Pantry Challenge. I wanted to be under $550 (half of our 2018 monthly budget) and we were! Yay! Feels super good, plus we still have food. If push came to shove, we could still eat. Weird meals. But food. Thank you to everyone who participated in this year’s Pantry Challenge! I loved having your company. I know many of you have enjoyed having a page to continue the chat. Feel free to continue the conversation here. As always, thanks for participating in the Pantry Challenge. It’s been so much fun to share this with you. D – we suddenly realized we had not used our ChickFilA coupons for the month, and they expire tonight, so dinner was free chicken nuggets plus we split some fries. I was going to add some of the kale salad but we weren’t that hungry so we didn’t need additional food. I do have a little bit of free space in the freezers, but seriously need to keep whittling and chipping away. For the next year. Non-stop. *sigh* I am going to have to break down and buy some bread. We have too much frozen deli meat, plus jars of jelly/jam/preserves, and toast/sandwiches would just be an easy way to start using that up. Past that, I am going to try really hard to stick to the $100/month target. (I was soooo close, $106 for Jan) Even if I don’t hit it, at least I’ll be thinking hard about whether I really need it or not. Six dollars over is not bad! Oh yeah, great job getting everything so cleaned and wiped out. The fridge looks so nice! Glad you are feeling better – or if not better then at least not worse. PS. I think the continuing-PC link is not the one you meant to post. It actually is. The site gets dinged if there isn’t a substantial post that folks are commenting on. So, I picked one that is a good general pantry challenge post. Hope you don’t mind! Where do I find the continuing pantry challenge link? I REALLY need to continue on the clearing of my pantry and freezer over the next few months. This is great for encouragement and meal ideas! Right here: https://goodcheapeats.com/pantry-challenge/ Scroll down for most recent comments. Thanks again for hosting this year’s challenge and providing us with a place to continue chatting thru February and beyond. Your fridge and pantry look amazing. As my pantry area emptied out I have cleaned mine out as well and rearranged it as well. My fridge is clean on the inside and the chest freezer is only half full and organized. The upright is another story–it’s a mess. This month I spent $103.29. That’s half of what I budgeted! It would have been lower if I hadn’t bought alot of things that will last for a month or more. There are only two of us eating so it will take a long time to get thru the proteins, veggies, broths and sauces I have stored. Lonch–My husband had the last piece of cooked chicken and the roasted sweet potatoes from the freezer. I skipped. Dinner–We had chicken stir fry from the freezer, and a bread stick.. He also ate a cutie. Thank you Jessica for the pantry challenge. It’s always a pleasure and I was able to bring my freezer down to just about no meat left. Only a couple of roasts, some fish, and some lamb chops, that’s all. Good job, Stephanie! I’ve got a good stockpile still, so onto February! I went over budget by $4.46 but should be able to recoup in the shorter upcoming month! We are finishing the pantry challenge well. We are going to the end of the week since I meal plan from Saturday through Friday. We saved some money and cleared out the pantry and freezer. We still have some random bits to use up. I have made a list of those items and will be incorporating them into upcoming meal plans. We also pulled together a box for the food bank of items that do not fit our needs. Mostly these are items that contain allergens we are avoiding due to recent diagnoses. Jessica our best wishes for everyone in your household to feel better soon. Thanks Jessica ! I hope you are healthy soon. I pulled out the last frozen fruit from the upright freezer and some homemade enchilada sauce, the sauce is for my freezer cooking session I’m planning for Saturday . Freezer has about 10 pans of ready to eat when heated meals mostly from January so nothing old. L burritos for husband , blueberry pancakes for kids and me. D chili , gluten free cake I made for kids’ half birthdays . We had a lot of chili in the freezer but I make a big crock pot full and freeze leftovers. I’m ready to go to Aldi on Saturday . We have quite a bit of meat from zaycon paid for and lots of good coffee. We aren’t ending with much cash because of that, but definitely ate any older freezer food this month . In order to avoid having things get lost in the depths of our freezers, I started keeping a written inventory of their contents. It took us a little while to form the habit of taking something off the inventory when we pulled it from the freezer (& adding things after a shopping trip), but it was worth it. It makes my meal planning so much easier–I can look at a list & see what we have that needs to get used up. Every couple of months or so, I organize the freezers & verify the inventory. 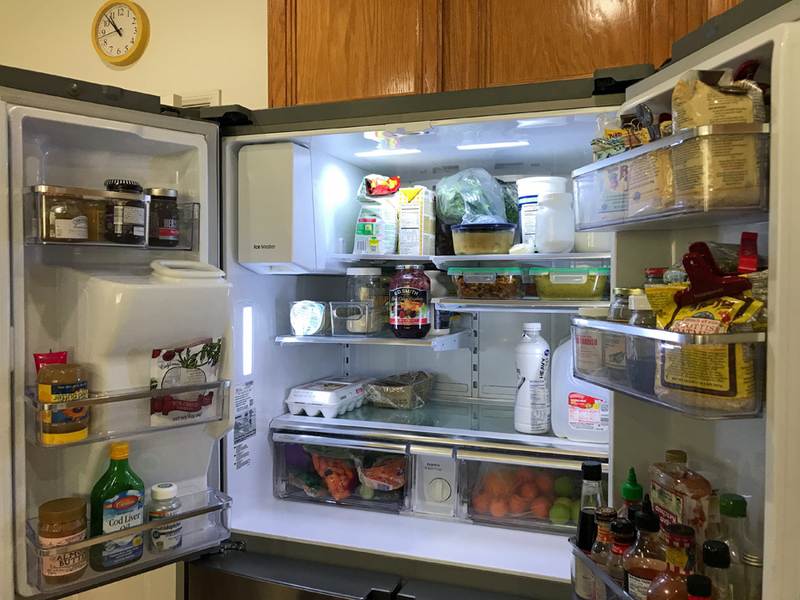 Thanks for sharing your pantry challenges with us–I enjoy reading about them! I do it hit or miss. With eight people potentially grabbing stuff, we haven’t made an inventory system fully operational. Definitely something to work on! Thanks for yet another successful PC Jessica. It’s always fun. I am retired and mostly have the time that is sometimes required to put a pantry challenge meal together. I have never told hubby in so many words that we are doing a pantry challenge but, as we have 2 freezers that are pretty full, it is almost a way of life. He knows we have full freezers and I don’t think he’s eversurprised at what I can pull out of there!! Anyway on to yesterday. S – a mix of taco soup and a beef vegetable soup, both from the freezer with toast. I don’t say anything to my husband either, except the occasional comment that we need to get this used up since we’ve had it so long. As long as the freezers are full and the pantry looks good he’s happy. He did once some years back ask if we needed to restock the pantry, and I said ‘Oh, I do that as sales come along’. Since then he’s been content and is not a picky eater, that does help. Since we mainly buy on sale and eat from the pantry and freezer, it is a way of life for us also. But the challenges have helped me pay more attention to how much to keep on hand and to pay more attention to rotating items. Thank you again Jessica for this Challenge and for giving us with the ability to continue to keep our spending in line, as well as keeping in touch with all the friends we have made over the years. Rest up and get better soon. Our total spending for January was $98.94. Made it under $100 and still don’t need to run out for any thing. Good job, Mona! I went over by $4.46. I did buy a $7.72 ham this month, an impulse buy but it’ll feed us for quite some time! Hoping to continue on into FEB. With FEB being shorter month, hoping for keep to my $100 goal! Nice work – it feels so good to be able to clean out food storage space and reorganize with a plan!! I bought half and half yesterday so I added $5 to our months total to end at $435 which is still half of our old budget. Moving forward I think $550/month is realistic for us. We needed t shuttle things down due to a fincancial shift in our life, so this is a starting point at least. I did already spend a good chunk of change buying pantry items online, but as they’re not to be delivered until today or tomorrow I’m counting them towards February. Although actually maybe I’ll split it between February and March since it will last that long…decisions. I’m glad you aren’t feeling worse! Hopefully you’ll be back to normal very soon. This month of the challenge has been a real eye-opener for me – thank you for providing this service! I always knew I overbought groceries, but I never quite realized how much. This month has taught me a lot about looking to what I have first when meal planning, and then filling in just what I need to from the store. We’ll be continuing to eat from the pantry and fridge for at least a couple more weeks. B: leftover French toast for my daughter, yogurt/granola for me, peaches/cottage cheese for hubby. L: Hubby had his frozen entree, my daughter had another lettuce and tomato sandwich (her new obsession) and I had the leftover sausage and farro. D: jambalaya and a lettuce salad. May I add my thanks for hosting this and the link for those of us who are continuing. Please continue to take life a bit easy and be sure to stay hydrated. I’ve noticed a tendency for those who try to bounce back to fast to have this come back on them. Congratulations on the clean frig, freezer and pantry. I will be re-organizing my pantry this next month, I hope. D – Tried a new recipe for sausage egg roll casserole, potato singles and fluff for dessert for him, chocolate candy for me. Hot tea for all. We are slowly getting the oats used up, and dinner let me use up a roll of sausage, the potato singles ( I won’t buy them again) and the last of the 3 bags of coleslaw mix I couldn’t resist at 88 cents each. I have enjoyed participating in the challenge. Best wishes for continued success to those who are wrapping up the challenge. I’ll be one of those continuing on the page Jessica provided. Last day of the month. Wow, did that go fast! I’ll probably do a little shopping on either Friday or Monday. D – we went to dinner with hubs sister and bil. Thanks for doing this, I enjoyed it. I still have some things I want to use up but am pleased with what I did this month. I can’t believe the pantry challenge is officially over. I definitely still have a ways to go though. Our final amount was $260.00 for the month, which wasn’t as low as I was hoping, but still better than normal. I was able to put $140.00 away for a month when I go over (which happens often enough). L: Leftover bbq over spaghetti squash with parmesan. Apple. Thank you so much for hosting the challenge and providing a place for us to continue! I’m so glad you’re feeling better, but don’t overdue it and go backwards. The bugs just won’t let up here. Hubs had bronchitis and a sinus infection last week and was on meds, but then Monday he started sounding really bad again. Went to doc yesterday and he tested positive for Influenza A. He started on Tamiflu and they had me start too in a low dose for prevention. They quarantined him for 6 days since this is running rampant everywhere this year. Our son that farms with us came down with it over night and went to doc this morning. He’s on Tamiflu now too, so I’m hoping it’s all short lived and they both start feeling better. With farming it’s so hard to rest enough. Someone has to do the work or the animals don’t get fed and the cows don’t get milked. Our busy weekend just all got cancelled now too. We had my Dad’s 84th birthday Friday night and we were hosting friends at our house on Saturday. Oh well, that should give me some time to get caught up on things I’ve been pushing off. I wish I could say my refrigerators and freezers would be as clean as Jessica’s, but I know that’s not possible. I’m terribly impressed how empty you got everything! My freezers will never be empty. My husband will fill it with some kind of meat that we butcher if it is low! Meals have been sporadic with hubs feeling bad, but we still are using things up so I will just feel good about that. I will be continuing on for awhile! Wow, January just flew by! Thanks, Jessica, for hosting the PC again. I’ll be continuing on into February because the freezers are still packed. It takes the three of us a long time to get through things (unless we’re talking about cereal, peanut butter, cheese, bread, and fresh produce–those things we fly through). I feel this was a successful PC in spite of the freezers, however. I wanted to come in lower than I did last January, which I did. I was about $9 over my hoped-for goal of $125 (which was mainly due to the blueberries I bought for the Eagle Project). Our total for the month was $133.77. My goal to trim our regular monthly budget this year seems doable. I did continue to compare per-unit prices to find the best deals, and I’ve started tracking all of our grocery spending a la “Grocery Geek.” I plan to continue these things throughout the year. Our home-prepped meals were heavy on fruits and vegetables, so we did well “eating a rainbow.” We also ate more homemade soups. An unplanned benefit was the development of a menu routine (cook M, W, F–w/ soup on F; LOs on T/Th/Sat; Mom’s day off on Sun.). This seems to be working pretty well for our family and is still flexible enough to accommodate days that our schedules are off for one reason or another. I was not able to try any new recipes, but we did eat some meals that we hadn’t had in a while. As mentioned, we did not make much of a dent in the freezers. The biggest “fail” came in the eating out department–still went over budget and simply ate out too much. Will try to do better in February (although that might be tough w/ Valentine’s day, my birthday, two oncologist appointments, and a big event at Hub’s work). Wish us luck! On to the final post for Jan.
L: The guys had PBJs, string cheese, carrot sticks, mandarins, apple slices, dried cranberries, and cookies. (Hubs added celery sticks and yogurt w/ granola and compote.) I had the last of the sloppy joe’s and some carrot sticks w/ ranch dip. D: HM Hawaiian pizza, salad, mandarins, extra pineapple not used on the pizza. S/D: I think son had a muffin after school. Not sure what, if anything, Hubs had. I didn’t have anything. I feel you with the eating out- we tried to dial it back in january and did pretty well for us, but still didn’t take it completely off the table. I suspect we’ll keep trying to keep it to a minimum, but with a quick weekend away, and the occasional desires that pop up, it’ll still happen. Just hopefully less like this past month! Yes, I don’t plan to eliminate all eating out (at least not yet), but we certainly need to cut back. It’s funny, but we got 2 meals from Chipotle with coupons last year, and that was it for eating out, and it was just fine. It’s just not something we do because it’s so much more expensive than buying groceries, even convenience type of groceries (which I rarely buy). That’s awesome! And you are so right about the expense (plus, homemade meals are generally much healthier as well). We just got into a very bad habit which is proving to be hard to break. Stick with what you’re doing; it’s much better for so many reasons. I’ve never thought of it as “grocery gee”k but I guess it is – I keep a list of all the groceries I buy (and the price) and every week or so I go through to see what I have used of what I bought. I find that keeps me accountable to ME. Put a line through the item when it has been used and when everything on that receipt has been used I put a big X through it – saves checking that shopping trip again. That’s a really good strategy for minimizing food waste! I’m trying to get a better handle on what constitutes “good” and “stock-up” prices. Since I am NOT a numbers person, I really need to write things down and then go back to analyze/compare. I did better last year budget-wise, and I’m hoping to improve even more this year. B- Strawberry protein shake and tea for me. Hubby away for work. Boys had protein shakes too. L- Leftover casserole for me, Son1 had the last of the leftover casserole. Son2 school lunch. Hubby?? Supper- Made 2 homemade pizzas with Jessica’s pizza sauce. Used up the last of the mozzarella, pepperoni, a pound of sausage and the last 2 pizza crusts (add water and mix kind). Hard to believe January is done. Time flies when we are having fun! This is the best I’ve ever done with the Pantry Challenge. $278.78 for our month total, our normal is $800-$900. So when I figured a percentage using $850. It’s just under 33% of what we normally spend!! I think posting for the first time made me more accountable. This was actually my 4th January for the Pantry Challenge. I still never mentioned what I was doing to the tribe or they probably would of been complaining the fridge looked empty. I will be continuing on into February but need to get somethings to go with stuff that needs to be used up. Need to keep things they eat often stocked or the tribe gets twitchy. Thanks Jessica for hosting the Challenge, yet again! I so enjoy your website even though I’m not a frequent poster. You have even helped me Fight the Frump and I’ve done some great updates to my wardrobe over the last year and a half. So much so my high school boys have noticed my Converse and Adidas sneakers and other hip outfits. Keep up the great work it’s greatly appreciated by me and so many of us. Can’t believe January is over. Crazy fast, busy month over here. Jessica, thanks for hosting this every January and thanks for the continuing-on page! You’re so awesome. I’ll be continuing, so I can attack the random things that have accumulated, instead of wasting, tossing, etc., and so I can watch carefully what I buy. Hopefully I’ll keep the spending down, too. Also, I finally opened up my new instant pot, cleaned the parts, and did the initial test run. Then I decided to try cooking hardboiled eggs in it, which I have heard is great, but I’ve heard various timings on them. I did two batches and I think I’ve figured out what will work for me. And it’s amazing how easy they are to peel! Amazing! I’ve had aging eggs I needed to boil for eating as snacks or in salads(LOVE them chopped in salads) and egg salad. So glad that’s done. Now to start trying out other recipes! I’m seeing the same thing Heather! Yes, ladies, it’s the right page. Just scroll down to the bottom to see the current comments. Come join the party! Last day of January but certainly not the last day of my pantry challenge! Lunch: leftover soup again, lemon yogurt; hubby had leftover soup and ? Dinner – DH had an Italian sweet sausage with peppers/onions in a leftover hoagie sub. I had a meatless meatball sub with peppers/onions in a leftover hoagie sub roll. Choc cake for dessert. Hurray! We made it through another challenge! Your fridge looks amazing Jessica! I did a little cleaning in mine. The PC went out quietly here. We adjusted our budget down to $200 a month for 2018. We do not count Zaycon in that budget or Costco. We don’t visit Costco very often and most of the time it’s for non food items or special occasions that aren’t in the regular food budget. We place about 4-5 item orders with Zaycon per year, so lowering our monthly allotment should take care of that expense overall for the year. We are also planning a larger garden this year. Thanks for everyone sharing, I really enjoyed it. Good luck to those who are marching onward with the PC! I’m curious how others handle restocking their kitchen after the pantry challenge is done. We did really well last month but are out of a lot of staple items we keep around. I want to restock but don’t want to spend all the money I saved in January just trying to replenish our fridge, freezer and pantry. I’m interested in hearing what you and others do. I’m buying what I need. I don’t think it will all cancel out considering the extra cooking I did, and all the beans we ate. But maybe don’t restock everything just what you will use in Feb . I restock as minimally as needed until the really good sales start appearing. Then I really restock. For example, we keep frozen pizzas on hand for those days when we’re tired, or mom is sick, or the schedule is crazy, or fill in the blank. I only buy the pizzas when they are on sale anyway but this weekend there is a great sale so, even though I am continuing my challenge into February, I am stocking up on these pizzas. This works for us and it’s definitely cheaper than calling for delivery! Hi Jessica! Try these to use up your wild rice. I make a triple batch of these and cook them, then freeze them with parchment between them in the freezer for quick vegetarian meals or to take in lunches. They are SO good. I make a big jar of the spice mix so I can make them any time. Also there is a creamy chicken and wild rice soup that is so delicious. I missed a few days again. I meant to comment last 2 nights but honestly when my head hit the pillow I was done. Baby is still getting up 3-4 times a night so I’m a bit tired. Good news is the days are getting longer. Yay! Here on the east coast the weather has been a mix of subzero temps and terrible weather (ice and snow) or a mild 50s funny kind of day. Weird. That said, I’m getting lots more eggs from my hens so spring will be here eventually! 9 each day for the past 4 days! Heather M- I make boiled eggs in the instant pot nearly daily. I do 9 mins on low pressure (for extra large eggs) and manual release the pressure and immediately into an ice bath. They do peel so easy! Trying to reember what we actually ate. Lunch was leftover pizza for the kids. I made a bunch of mason jar salads (so 2014 I know!) and hubs and I had one of those. They stay fresh and makes sure I eat a salad a day. Mandarin orange Asian with sesame vinaigrette. Saturday: breakfast was scrambled eggs and sourdough toast. Lunch: kids had leftover pizza again. This polished it off. Hubs and I had salads. This time I made them a southwestern flair with roasted corn, black beans, and mo jack cheese, lots of veggies. Very tasty. Lunch was made (with minimal assistance) by my 6 year old. She loves to help and I’ve been teaching her lots. She picked black bean and brown rice burritos for lunch so I pulled black beans I had cooked and froze and brown rice all from the freezer. I made some pico and we enjoyed them. Bonus there is one left for her lunch tomorrow! Continuing on with the challenge. I had to explain to my dear husband yesterday why he had to get some fresh food at Costco yesterday even though I’m trying to empty the freezers. He doesn’t get it. I said if you can figure out a way to freeze lettuce let me know. Lol. Until then we will need to get it fresh! I think he understands now. One can only eat so much frozen fruit before you really really want a fresh apple or kiwi. Lol. B: Oats and milk for DH. Oatmeal for kids. Toast and coffee for me. L:Packed lunch for DH and DD1. Rye bread with fish for DD2. She had 3 slices – must have been hungry! WW bread with fish for me. Veggies on the side. D: Leftover roast and gravy, served with boiled potatoes, carrots and broccoli.